Wisdom of Life. : Beautiful Lesson of love. The girl in the picture is Katie Kirkpatrick, she is 21 . Next to her, her fiancé, Nick, 23. The picture was taken shortly before their wedding ceremony, held on January 11, 2005 in the US . Katie has terminal cancer and spend hours a day receiving medication. 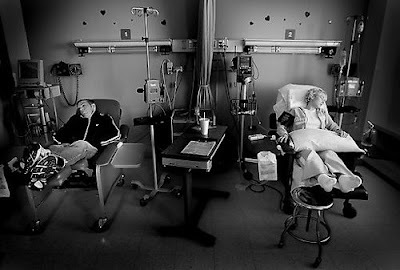 In the picture, Nick is waiting for her on one of the many sessions of chemo to end. 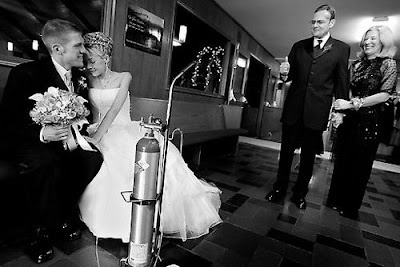 An unusual accessory at the party was the oxygen tube that Katie used throughout the ceremony and reception as well. The other couple in the picture are Nick's parents. Excited to see their son marrying his high school sweetheart. Katie, in her wheelchair with the oxygen tube, listening to a song from her husband and friends. At the reception, katie had to take a few rests. The pain did not allow her to stand for long periods. Katie died five days after her wedding day. Watching a woman so ill and weak getting married and with a smile on her face makes us think..... Happiness is reachable, no matter how long it lasts. We should stop making our lives complicated. Life is short Break the rules forgive quickly kiss passionately, love truly laugh constantly. And never stop smiling no matter how strange life is Life is not always the party we expected to be but as long as we are here, we should smile and be grateful to God for the gift of LIFE. Wow, that is amazing. It is amazing that love really bonds people through the worst of things. The poor husband. I hope he is doing well! I am sure, its difficult to get such man as true lover. I salute to him.